Margaret Island is located in the heart of Budapest, surrounded by the Danube. The popular tourist destination is a piece of green area in the Hungarian capital. If you are visiting Budapest as a tourist, you should definitely visit the island. Margaret Island is a place of silence and tranquility, and you don’t have to go too far for this pleasant environment. Its medieval ruins are reminders of its importance in the Hungarian history (Middle Ages) as a religious center. There are no private houses in the 96.5 hectares of landscaped areas, only one or two hotels, restaurants, and sports facilities. Even cars cannot drive to the island, ensuring the total peace of the visitors. Of course, taxis and the buses of BKK are exceptions, which also serve the convenience of visitors. Even sightseeing cruises stop at the dock during the summer time. But before we learn how to get to Margaret Island, let’s see some of the interesting things about its history. Budapest Margaret Island was inhabited during the Roman era since the river Danube was the boundary of the ancient Roman Empire. Margaret Island had many names before; perhaps one of the best known is the Island of Rabbits. 2 – No 2. is much more interesting, it is based on a wrong Latin translation, when instead of leprorum they wrote leporum, so the real meaning was the island of leprosy. Otherwise, this can be justified by the isolation from the city and the buildings. 3 – Another name was the Island of Lords, later on, the Island of Buda. The present name of the island was given after the daughter of king Béla IV, who was called Margaret. St Margaret lived in the monastery of the Dominic Order, according to the King’s vows under the Tatar invasion. According to the legend, their parents, in their despair for the defeat of the Tatars, offered her to save Hungary. Margaret Island has always been a popular place, inspired by many artists, writers, and poets. In 1908 Margaret Island was declared a public park. For the most active ones the island offers runways along the beautiful Danube, swimming pools, but it is also a good place for walking, cycling, roller-skating or only to lay down and have a picnic in the park. If you are interested in culture you must see the Centennial Memorial of 1973 commemorating the hundredth anniversary of the city’s unification. Other main sights are the Music Well, a small pavilion, which was originally built for open-air concerts, the Music Fountain, a fountain near which music is played and light shows are performed in summer. The octagonal Water Tower built in Art Nouveau style in 1911. Today it’s functioning as a lookout tower and an exhibition hall also attracts tourists. You can also visit the ruins of Dominican monasteries and the tomb of St Margaret. Sports programs are available too since the Alfréd Hajós Sports Swimming Pool often hosts prestigious swimming or water polo events. But how can we go to Margaret Island Budapest? 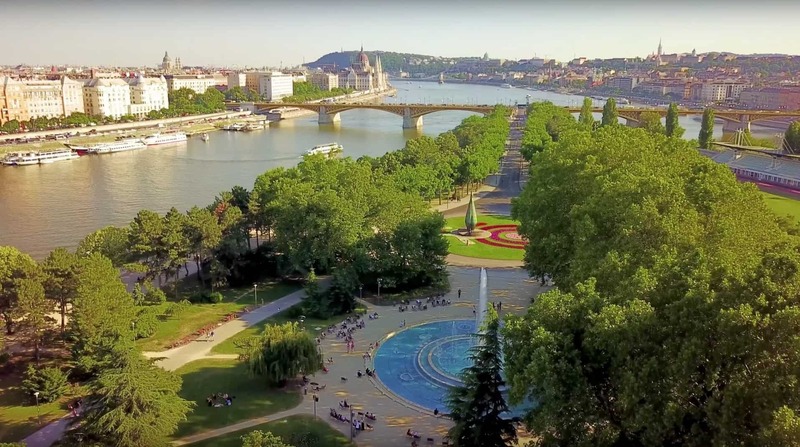 The 1.55 miles long and 0.31 miles wide Margaret Island stretches between Árpád Bridge and Margaret Bridge in the embrace of the Danube. The view is amazing since you have a perfect view of the Pest and to the Buda side as well as to the Hungarian Parlament as well. The best ways to get to there is by tram 4 or tram 6, get off at „Margit híd Budai hídfő” stop, or take bus 26, the only form of public transportation on the aisle, from Nyugati tér (M2 blue metro, trams 4, 6). The bus is the only vehicle which travels through the island. If you don’t want to walk, there’s a possibility to rent a Segway or a bike. Until 1901, when the connecting walkway had been built, the island could have been approached only by boat or ship. Impressive, though, a bit slower way to the island by boat. Thanks to the high demand, private motorboats (with staff) can be rented too. Budapest Margaret Island is a very unique place, separated from the city noise, yet close to the center. Once you visit Budapest, don’t miss this island if you need a perfect relaxation. If you prefer to visit the island in a unique way but don’t want to rent a private boat, join one of out sightseeing cruises and take off on the Island from the Hop on-Hop off river cruise. Please visit our timeline for more information since the cruises stop on the island only during the main season. You will definitely get an unforgettable experience by visiting the center of Budapest in the middle of the Danube.